DUBAI (CNNMoney) -- A juicy burger has sold at a charity auction in Dubai for $10,000. Asma Al Fahim, founder of Dubai lifestyle magazine Villa 88, phoned in the winning bid. 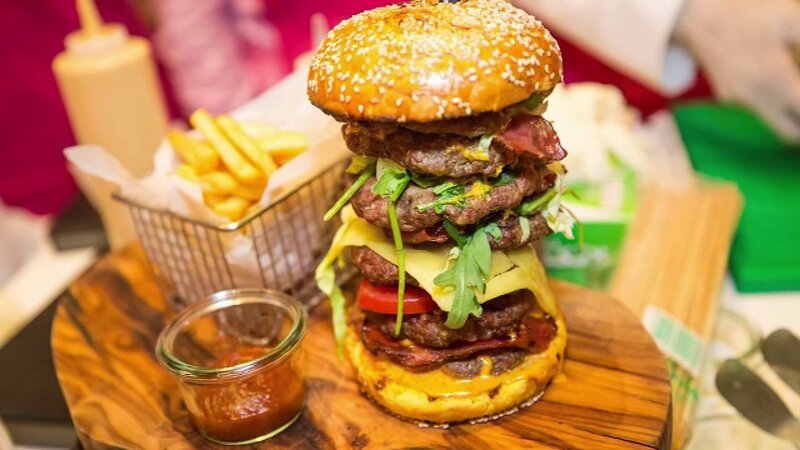 The giant burger contained seven beef patties, one for each of the emirates in the United Arab Emirates, aged cheddar cheese and veal bacon strips in a saffron brioche bun. It was prepared by Russell Impiazzi, culinary director at Le Gourmet in Dubai's Galeries Lafayette, and a member of Qatar's royal family, Sheikh Mohammed bin Abdullah Al Thani. "Two years ago we broke the world record by selling one burger for $7,000, and this year we wanted to top that," Al Thani said in a statement. "All proceeds will go to breast cancer awareness and free detection at an earlier stage." The auction was run by Pink Caravan, which campaigns to raise awareness of breast cancer. Al Fahim said she wanted to support a good cause and honor former Pink Caravan director Ameera bin Karam ,who died in a house fire last year. The pricey burger was one of four that were auctioned, alongside several other dishes. The sale raised a total of $29,633.